On a Chicago visit I joined the Saturday night crowds on North Michigan Avenue hoping that I might find images that were markedly different to those made earlier in the day. I also wanted to wander indoors and out camera-free. One corner store was behind scaffolding for builder access and pedestrian protection. I liked the darkly balanced tones of the poster portrait and the cars waiting at traffic lights that enclosed the brightly lit walkway and its ephemeral people. 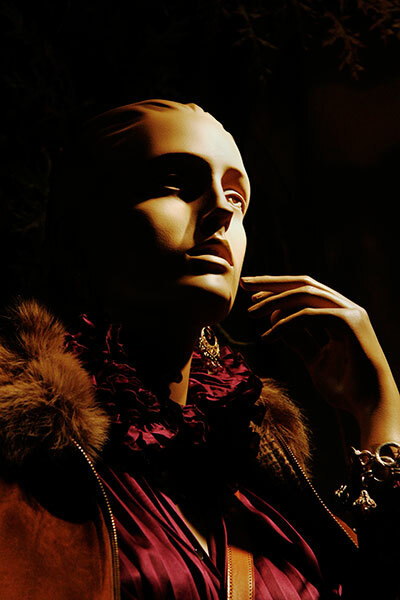 As I usually work to avoid including people in compositions I thought that shop window mannequins might be a theme to explore outside that stricture. I remembered the only such image made was from a wedding shop in Granada and posted in the SCULPTED HEADS IN PUBLIC PLACES gallery. Michigan Avenue is well known for the up-market stores that flank the densely flowing traffic. In daylight I'd photographed some combined reflections and displays amongst straight architectural compositions. 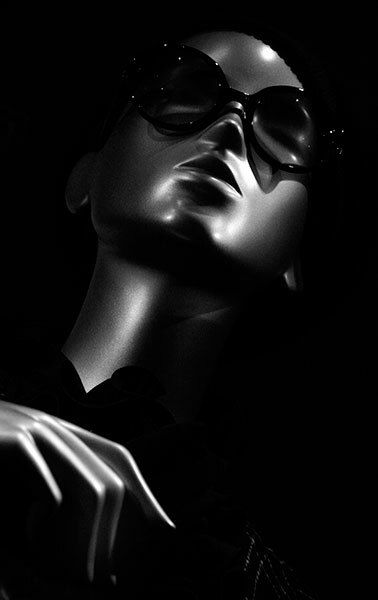 In this set I wanted to eliminate reflections and compose portraits as I might in a studio. As I've only once worked on such portraiture under lights I couldn't draw much from past experience. 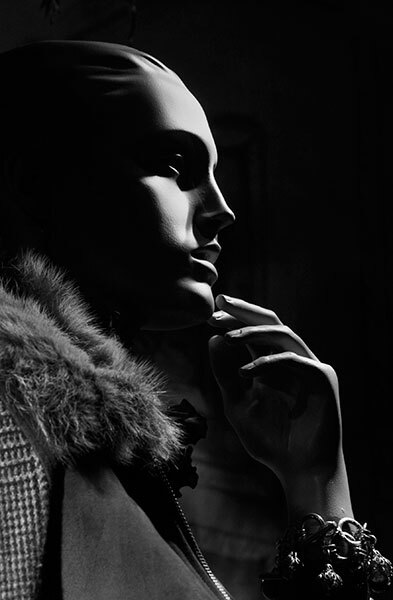 At least in the studio the model can be directed and the lighting manipulated in all manner of ways. Out on the street cut off from these static models by plate glass the task was rather different. Adjusting exposures to avoid burning out spot-lit highlights would give the low key images the rich colour and tones that I sought. I'm much more relaxed than I used to be about working with a tripod amongst walkers on city pavements in daylight but felt less so after dark; my night photography practice is almost non-existent. I was conscious of a greater need to be more alert to what was happening around me. 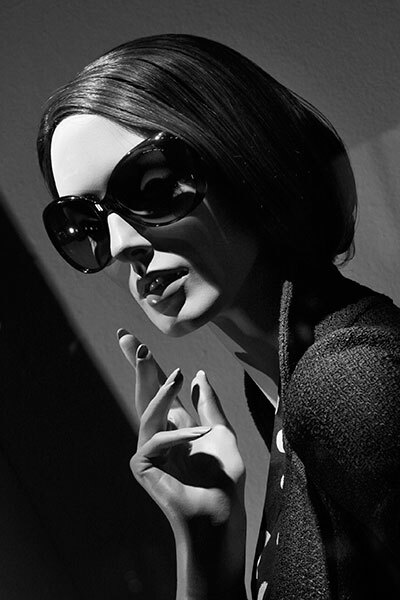 Speculation on what passers-by might think of someone photographing shop window dummies was brief. Unexpectedly here were far fewer full figures than anticipated but as I was making several images of each this was a disappointment rather than a problem. I'd already anticipated that the final collection would include colour alongside black and white. 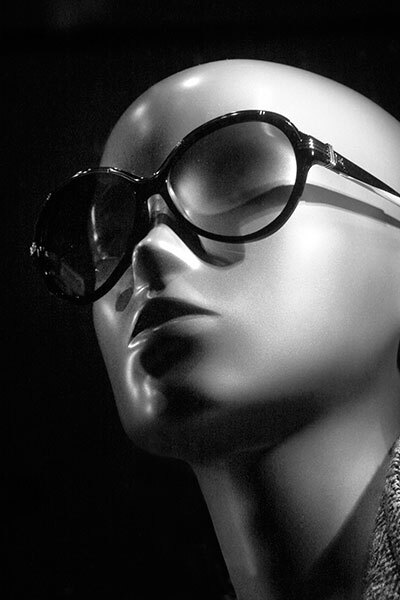 Fashions change but I hadn't fully registered that so do the styles of the dummies that display them. 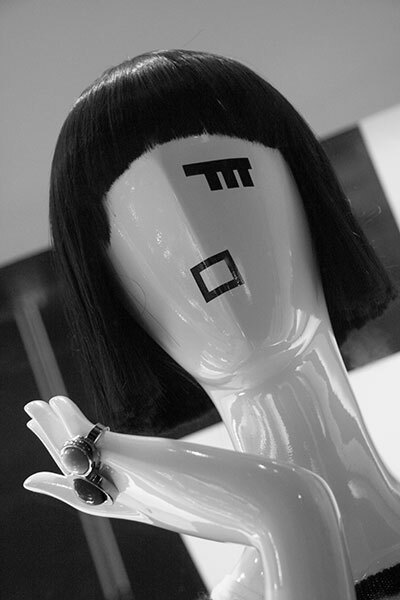 I later window shopped at home and they seemed to follow the Chicago fashion for the headless form in white, grey or black. 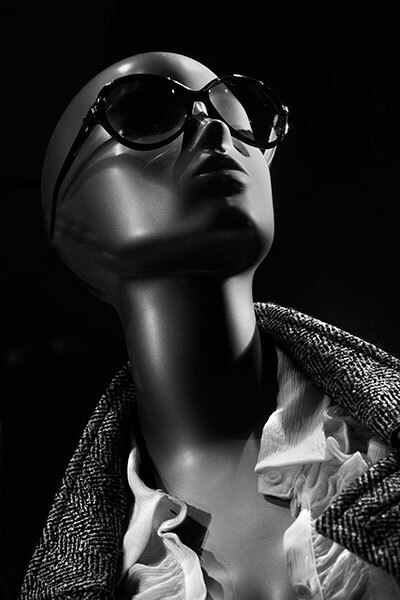 More shopping malls where photography is forbidden and fewer stores fronting public streets also restrict in the search for potential portraiture. 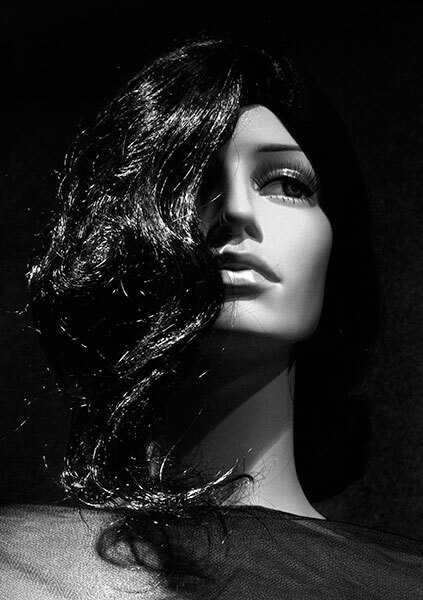 Another mannequin and different lighting prompted this low key image. 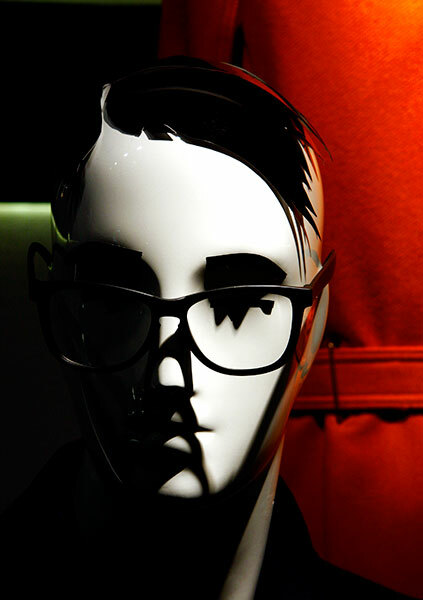 I liked this spare and stylised head dressed by the bold spectacles. The spotlighting and resultant highlights required camera settings that beautifully created a dark void to envelope the model. The simplification of form and detail hinted at the sculptural abstractions of Brancusi. 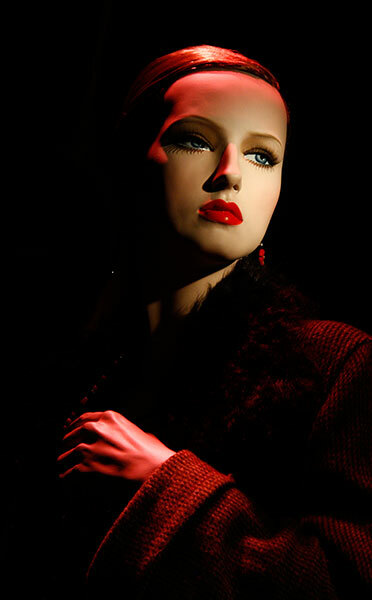 The red lighting enhanced the colour of the clothing and lips. 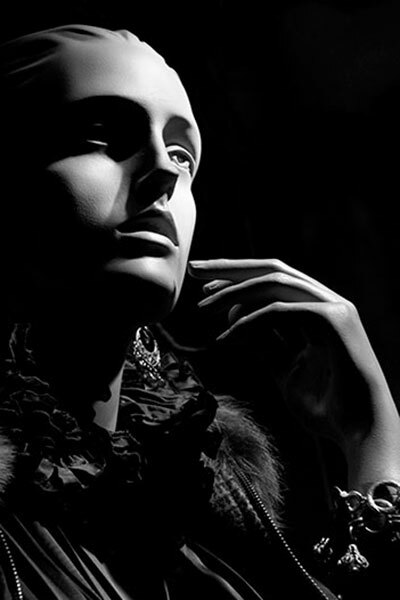 The lighting in this monochrome image emphasised the same model's profile against the intense black of the space beyond. The abstracted form and gloss white surface of this figure and the bright window volume provide a contrast in the collection. 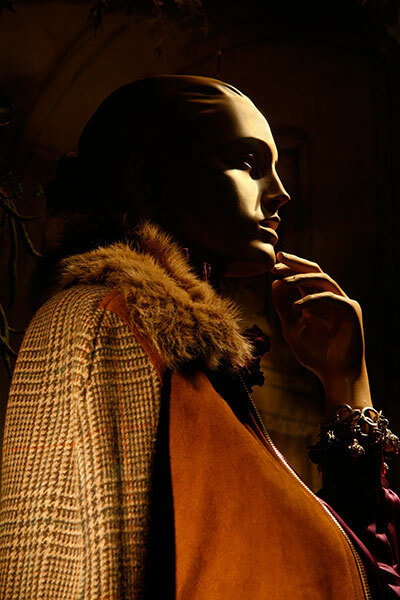 I liked the warm lighting on the rich garment colours and textures in this composition. Same model, same interest but shot from a slightly changed vantage point. 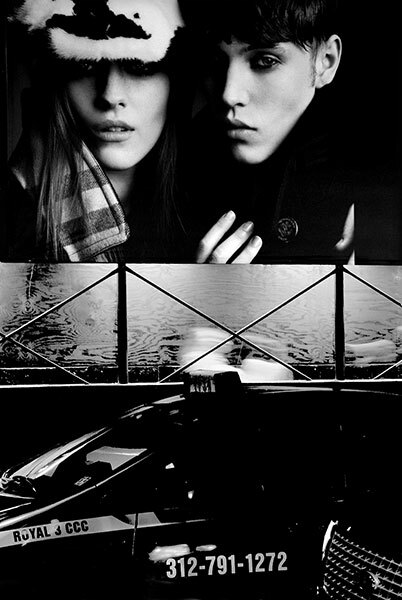 A closer monochrome framing picked out the diagonal light movement through the facial features, fingers, hand and wrist. Again, I wanted to frame the features more closely from the same viewpoint. 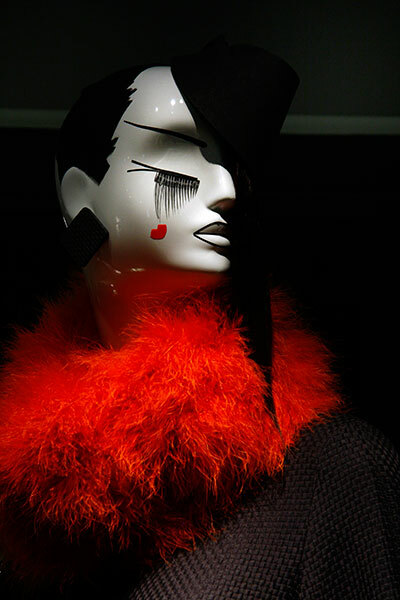 I liked this and the following image for the idiosyncratic mannequin designs and the contrast of blazing red against black and white. 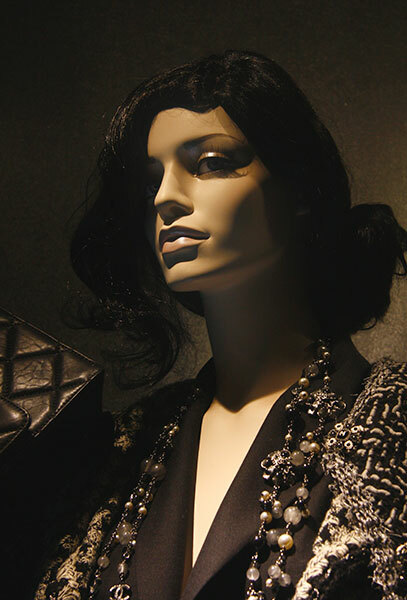 The stylised facial features seemed absolutely appropriate to their store window setting and the pictorial compositions offered. I was struck by the background geometry to the head formed by the black-to-red centre line and the offset relationship of the two horizontal elements. I don't think that I could have improved on the composition had I been able to arrange the still-life myself. I wished then that I'd had more time and opportunity to develop the theme.